It's time for the BearyBox's Sketch# 11! We have started our double figures! Here is my take on the sketch# 11 for the BearyBox blog. 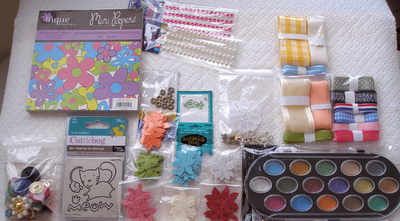 Want to win a bag of goodies? THIS link will take you directly to the sketch. Take part and get that bag filled with goodies! I scored! Yup! Can you see the vertical scoring lines on the background? I did it! LOL I used an empty ball pen. Please click on the piccy for a BIGGER and BETTER view! I have used the styrofoam balls as flower centers this time. I like the effect. The flowers and swirls are hand drawn. The sentiment is hand written. I forgot to add a cute little butterfly which I made. It was supposed to be placed on the top left side. Anyway, I love this card! It came out beautifully. Looks better in real life. Another Valentine card. This one is for my friend Sofia's sister-in-law. I chose a completely different color and went with off-white and gold. I took my inspiration from Laura’s sketch at 2SfY. I Tried to do something different this time. Instead of an envelope I decided I should make a box without a lid. There is no lid but I have used gold net to cover the top. Please click on the piccy for a BIGGER and BETTER view. 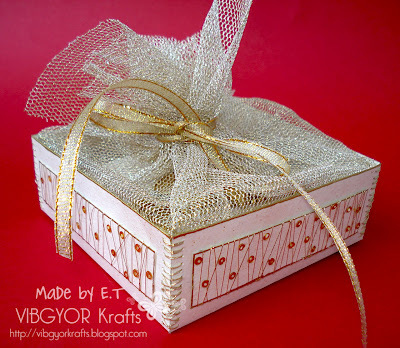 I stitched the box together with double gold thread. 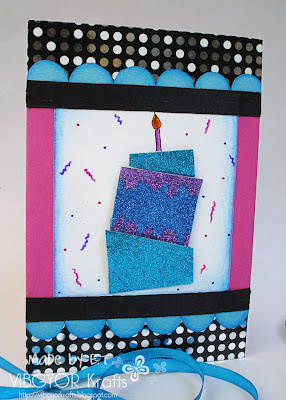 Now for the inside; the card is 4x4 and has a belly band. 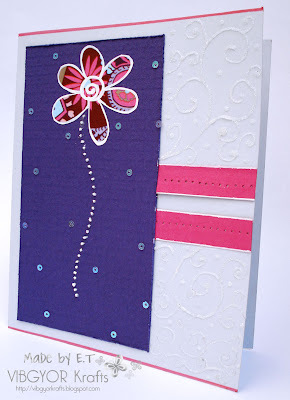 It is a tri-fold card. I decorated the inside to the minimum; Hence, no photos of the inside. It's time for the BearyBox's Sketch# 10! We have started our double figures! Here is my take on the sketch# 10 for the BearyBox blog. 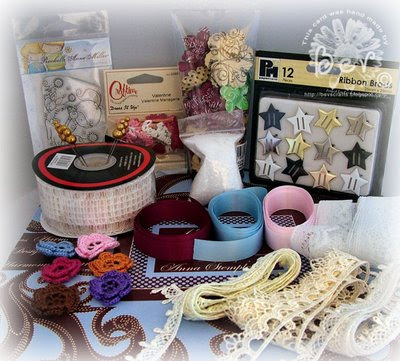 Want to win BearyBox's gift certificate? THIS link will take you directly to the sketch. Take part and get something for yourself! 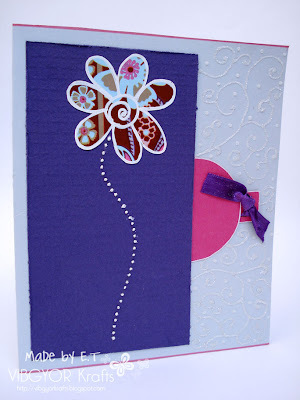 For today's card I used a mauve and white printer paper. I have used white cardstock as the card's base, but my white card stock it not as white as WHITE is. So I used a printer paper instead. 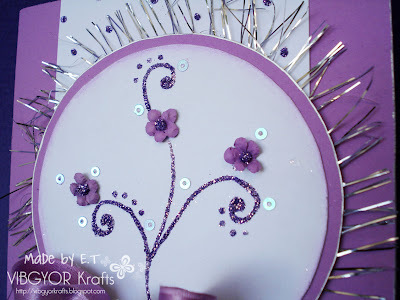 I have not got my cuttlebug embossing folders yet, I thought I would make my own glittery Swiss dots! Please click on the image for a BIGGER and BETTER view! The flowers are hand drawn and so is the swirl. 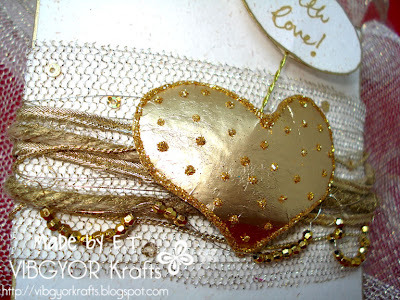 I added little bit of sequins to the ribbon just for that extra oomph! I didn’t plan on cutting the circle SO big, but in the myriad events something went wrong! Please CLICK on the image for a BIGGER and BETTER view. 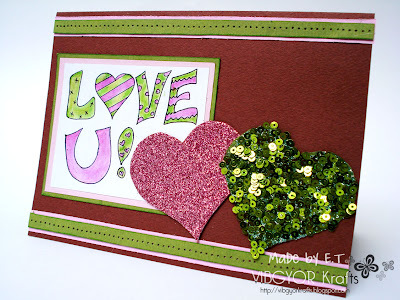 The challenge at Charisma Cards is "love". My card fits the theme. 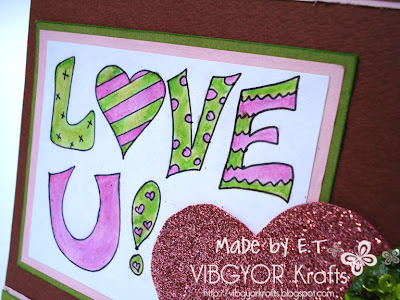 Here are my two glittery pink and sequined green heart! 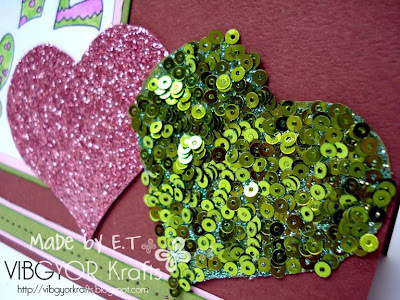 I think the sequin green heart belongs to Mel. LOL. After all she has a moldy heart nowadays (she cracks me up, silly girl!). I hope she gets well real soon, we all have missed her work! 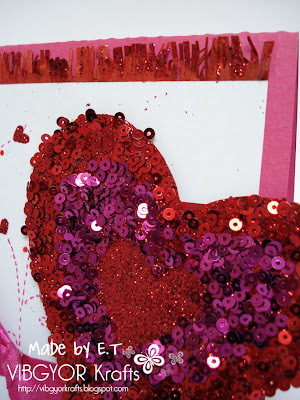 I have planned on making lots of Valentine cards. Well, that is what I have planned. Now I have no clue when I am going to go about executing the plan! 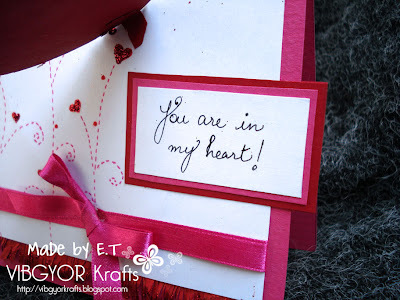 The hearts are hand drawn and obviously as you can all see the sentiment is hand written. 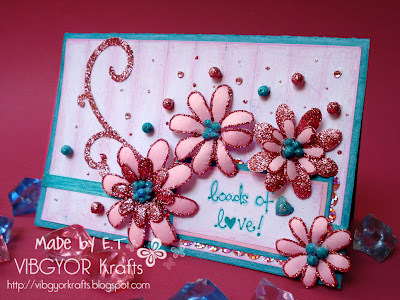 Today’s card is all about looove! LOL Using Laura’s sketch from 2 sketches 4 u, I decided it’s time for some love cards. 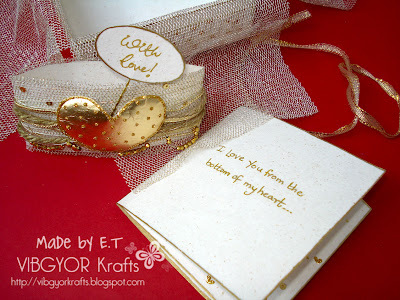 Yeah, and I reaaaaaaally went ahead with the love theme! LOL - over the top? I think YES. 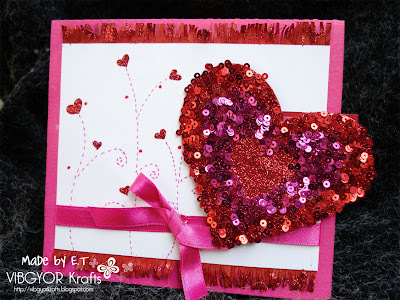 But someone would love this card, I know that someone, she will be oohing and aahing over this card I am sure about it! Today nothing was going right for me, in terms of taking picture. 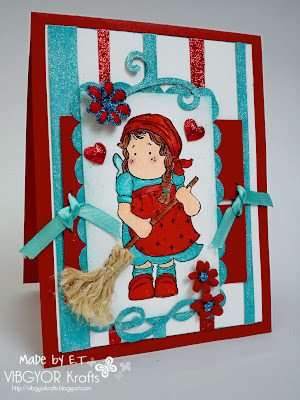 I just didn't seem to get the right background for this picture... First, I took the pics using white background but the card looked so washed out, as if part of the background! Then I used my sweater! LOL That didn't work either. I gave up. It's time for the BearyBox's Sketch# 9 already! It is nice to be responsible to create something each week. And I am loving this! Here is my take on the sketch# 9 for the BearyBox blog. 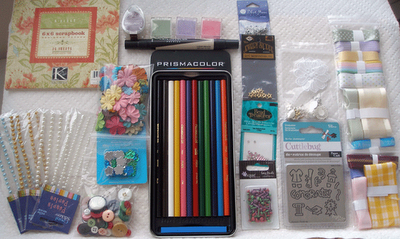 Wanna win some goodies? THIS link will take you directly to the sketch. Take part and win some stuff! I just took scraps of paper to build tiers of the cake. Applied different colours of glitter on the tiers to make them look interesting. The scalloped kinda thing is made by using a compass. 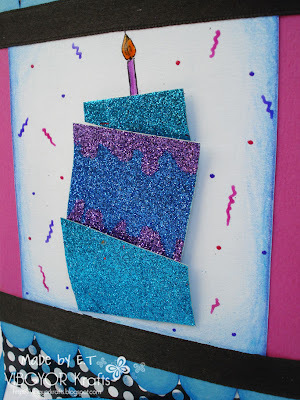 I drew several semi circles and shaded them with different shades of blue to match with the glitters. It's been a while since I have used a stamped image. This image was sent to me by Bev. I wanted to do this colour combo since quite some time, I finally got to it! I cut strips of red and cyan chart paper, colored the cyan paper with a darker color pencil to get the color I wanted. 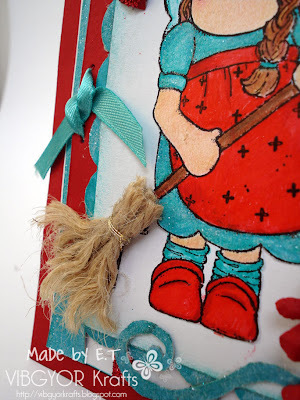 Applied white glitter on cyan paper and red glitter on red. 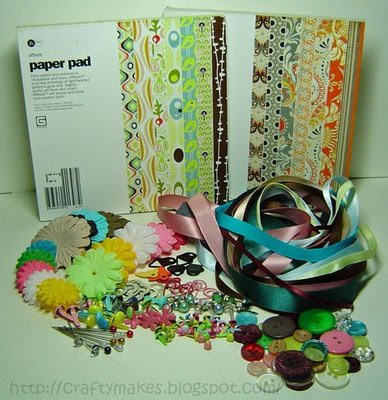 I didn’t want to use any decorative paper, wanted to do something different. I saw the sticky tape technique on SCS but I didn’t want to do that either :o) so this is what I chose to do. 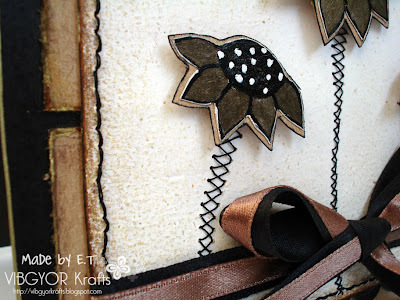 The scalloped kinda thingy is made by the help of a BUCKLE punch that Steph gave me. 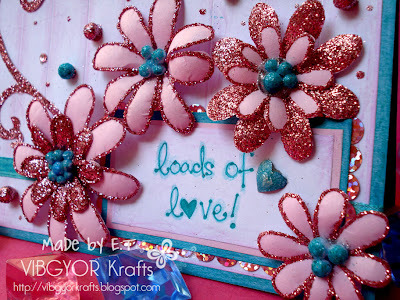 The swirls, hearts and flowers are hand drawn. Here is Bev's candy, take a look at this... and note that this candy holds more! 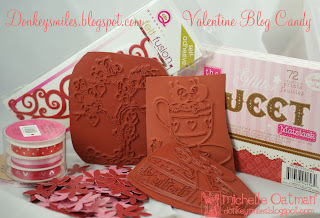 Want some Valentine blog candy?!?!? MichelleO is offering some! Vist THIS post and just enter! Emma is offering some candy on having 3000 hits in just nine months! Check THIS post. Sally on the other hand is offering TWO blog candies. So you have more chance to win. Go to THIS post! I love this wrapping paper. 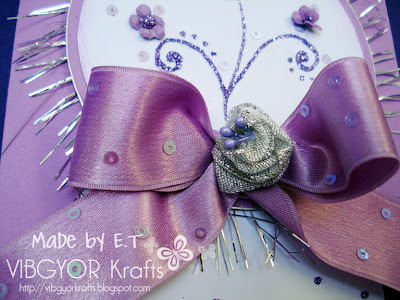 It goes with pink, light pink, turquoise, light blue, mauve, grey, brown... the list goes on! The only problem with this paper is that is just too glossy. Taking pics is a huge problem. Oh yeah, as always I drew the flowers by hand this is why both of them are different. At first I left this right side plain, wasn't liking it. 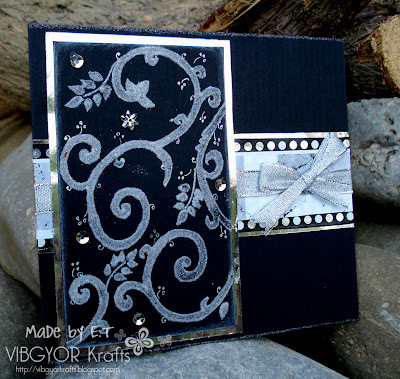 So I drew some swirls with a transparent embossing paste and sprinkled white glitter on it. Here is my take on the sketch# 8 for the BearyBox blog. THIS link will take you directly to the sketch. Don't forget to checkout the goodies they are offering! I tried to change the sketch somewhat. This is not what I initially had in my mind. 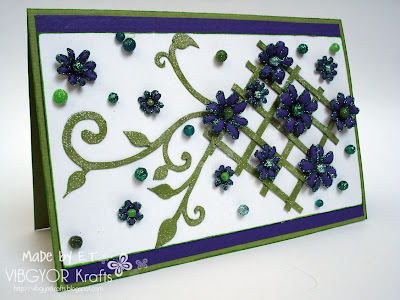 First I thought I would run the lattice across the card, just like in the sketch. But then I thought the lattice could replace the pocket kinda thingy and the horizontal divide can be replaced by some leafy swirls! Remember the Styrofoam balls that I used earlier HERE? 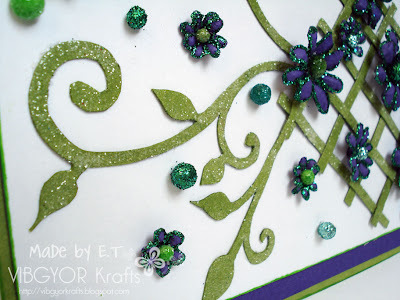 Well this time I applied glitter and colored a few of them to disperse them around the flowers and swirls as fillers. And also the middle part of the flowers is made using the same Styrofoam balls. 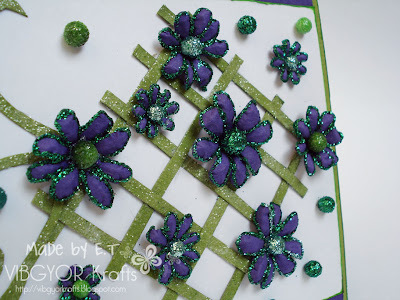 The lattice and the leafy swirls are all covered in white glitter. 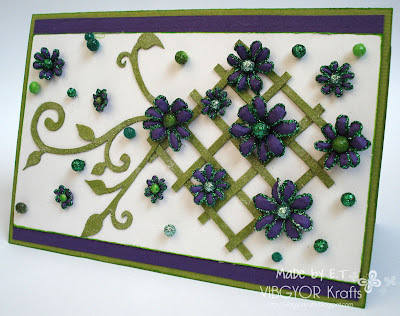 The flowers, swirls and the lattice are all hand drawn. 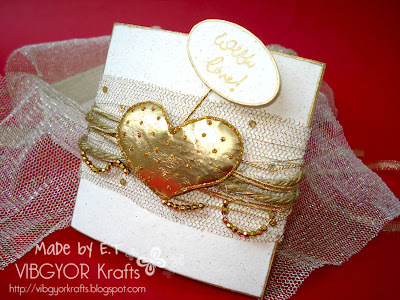 The card that I have to show you today is based on a sketch from “Our Creative Corner”. It has been a very very long time since I participated in a challenge. 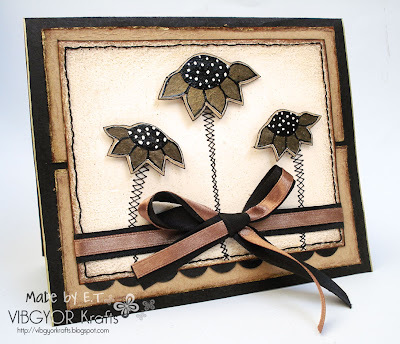 At first I thought I would use some gorgeous earthy papers that Steph sent me, but then as I drew the flowers I inked them up, the papers and the flowers didn’t seem to belong together. 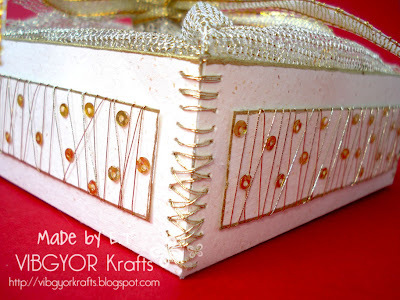 I am becoming a fan of stitching, and as I am still scared to use a sewing machine because of one terrible childhood memory, I thought I would just stick to hand stitching for now. Well you can see the irregularity amongst the stems and the border because I stitched by hand. That would have been better if only my piercing was good enough! LOL I pierce with a fat needle and have to mark the line where i have to pierce, always goes wrong! Before reading today's post you MUST check THIS post. 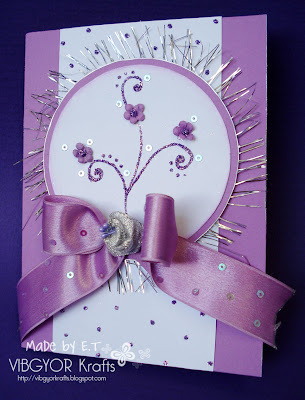 The card you just saw was my very first creation and a first attempt at an inspiration challenge... or any challenge for that matter! It was also my first card post! I didn't even know how to take a good picture back then! I thought that I should remake the card. Here it is! Hey peepz how are all of you doing? I have not been making a lot of cards lately. I was taking a break... and now I will be getting back to work. 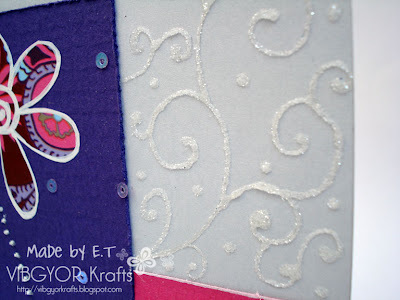 The card that I have to show you today is different because I used one of the punches that Steph sent me. It was basically a buckle punch, I just cut out the middle part to make it into a ring. 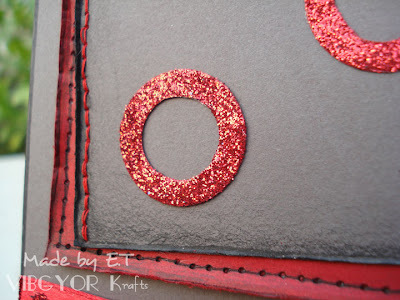 The rings are glittered heavily with red glitter. 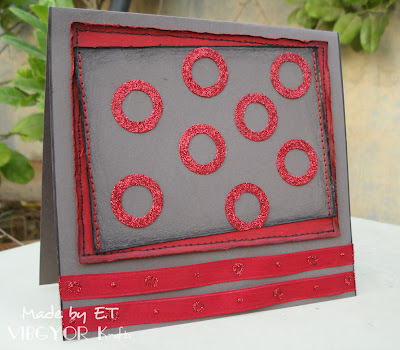 I used a contrasting colour such as red because the grey was looking very dull alone, but I must tell you this that IT IS a beautiful grey! You can see here that I have stitched the grey flap with a red thread and the red flap has a faux black stitching. 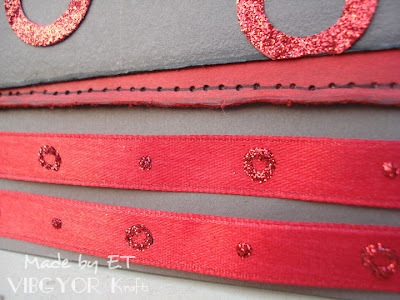 I have also shaded both the red and grey flap with grey and black colour pencils. This card is better looking in real life.